Pearl Clip On Earrings. 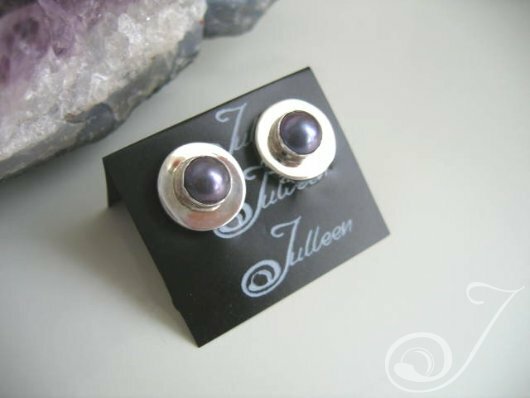 Mounted 6mm Blue Pearl Clip on Earring Sterling Silver 92.5 – 14mm. Lower Bezel Depth (thickness) - 2.3 mm. Base Diameter – 13.4 mm. Top Bezel width is 7.8 mm including the pearl. The Pearl - 6.8 mm. It’s often so difficult to find clip on earrings for women who don’t want their ears pierced. With this in mind we created the clip on pearl earring. Now a mother of the bride or the bride herself can feel the luxury, of wearing pearl earrings at any time. These are so comfortable to wear and would enhance any outfit for a wedding or any time of day or night for many years. A classical style that will never date. Also available in a gold setting, called clip on Bethany earrings, these delightful purple blue cultured pearls come from the black pearl family and when seen, with this lustre and heavenly hues, we just had to share the opportunity of wearing these lovely pearls, with ladies who need clip on pearl earrings.